On Tuesday, the first two legends of the Champions League quarter-finals took place and, as it should be otherwise, there was once again a big surprise. Ajax Amsterdam also threw Juventus and Cristiano Ronaldo out of the competition after defending Real Madrid. All the greater is the anticipation of the other games during the week. On Thursday in the Europa League have resulted after the first leg some exciting constellations. One team hoping for a surprise is Slavia Prague. The Czechs, as a big underdog in the round of the last 8, are in a less than ideal starting position after their 1-0 defeat at home to Chelsea London. At Stamford Bridge it would take one of the legendary European evenings to make it to the semifinals. The blues on the other hand should not take the opponent lightly so as not to experience a nasty surprise. Almost a matter of course is the fact that Chelsea against Slavia Prague in the odds for a tip on the winner in front. The British are clearly favored with a quota of around 1.35, while wagering can be increased more than tenfold with a bet on the away win. Experienced referee David Skomina will lead through the 90 minutes in London and the referee’s whistle will be heard punctually at 21:00 on Thursday night. Chelsea plays a decent season overall, but without convincing completely. Coach Mauricio Sarri was therefore sometimes more and less in the criticism. In the extremely strong Premier League, the Blues play with Arsenal, Tottenham and Manchester United for two qualifying places for the premier class. Liverpool and City are too strong for the competition at the top of the table this season. If the top 4 in the league are missed, which has become more likely after the 0-2 defeat in the top match at Liverpool FC at the weekend, the emergency plan would have to grab. This would mean that qualifying for the premier class would also be possible by winning the Europa League trophy. Two birds with one stone could be killed, as an international title win Chelsea would like after the last rather unsuccessful years. However, before such goals can be realized, it is necessary to solve the mandatory task on Thursday evening. For quite a few experts, Chelsea Vs. Slavia Prague’s tip on the blues from the start the safest of all quarter-finals. In the first leg, this tendency has been confirmed a bit. Although Sarri has left superstar Eden Hazard on the bench at the start, for example, the higher individual quality of the guests became apparent over the entire 90 minutes. After the Belgian in the second section of the game then was allowed to field, he quickly pulled the action to himself and was hardly to be slowed by the Czechs. Hazard probably will start from the beginning in front of a home crowd. Even otherwise, there are only a few players who are not fit, which is why the coach can draw personnel from the full. Antonio Rüdiger is one of the few players who have to fit the Czechs. Of course, this does not change the fact that between Chelsea and Prague the odds are rightly distributed in the direction of the home team. Slavia Prague has already achieved history. As the second team in their country, the Underdog has reached a European quarter-final in the concert of the big international clubs. The win against Sevilla FC could hardly have been more spectacular and dramatic. Two goals in extra time made for a great sensation and the Czechs have rewarded with a duel against Chelsea FC. The fact that this hurdle will be even higher, everyone was aware and Prague has / has nothing to lose. Of course, the disappointment was still great after the first leg a week ago. Especially thanks to the very courageous performance, the hosts had at least had a draw. As usual defensively strong with their counter-pressing made the protected of coach Jindrich Tripisovsky the favorite of the island life long hard. The problem was just as obvious. Forward, the precision and determination were lacking. The tactical attempt to pull a fast man on the wing with attacker Peter Olayinka, went wrong. The 23-year-old was even replaced at the end of the game because he was not as well as usual in the Czech league. There he usually acts in the center. Therefore, on Thursday he will probably be on his usual position again. With 70 goals in 28 games Slavia Prague is by far the most offensive in the domestic league. The underdog must demonstrate this quality on Thursday in the British capital. Only then can the so far very strong season, in which the team is well on its way to becoming the national championship, be crowned with the entry into the Europa League semi-final. To meet Chelsea Vs. Slavia Prague to get a good prediction, it is mainly the starting position and the first leg to assess. In the Czech capital was clearly the difference of the two clubs to see. Slavia worked with a lot of passion, fighting, running and dedication, while the blues had very clear advantages in individual abilities that ultimately made the difference. With the lead in the back it can be assumed that the approach of the Londoners on Thursday will be similar. The team of Mauricio Sarri will focus primarily on a concentrated work against the ball and trust that the exceptional performers like an Eden Hazard for the one or the other bright spot worry. A rather poor first half, possibly without goals, is therefore not unlikely. 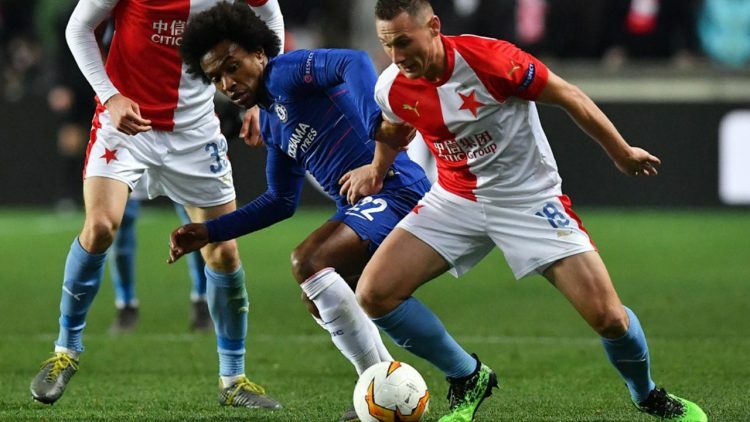 The first leg a week ago was the first comparison between Chelsea London and Slavia Prague, which can be used for a prediction to the match on Thursday in the British capital. The 1: 0, which the blues achieved late, was symptomatic of a game of two clubs with different individual levels. The involvement of the hosts was over the 90 minutes, although much larger and at least a draw for the Czechs would certainly have been earned, but in front of the goal was then finally missing the punch. Chelsea convinced with great efficiency and cold-bloodedness in front of the goal and thus has all the cards in the fight for the semi-final ticket in his own hands. In the second round, the guests are forced more and more to increase the risk in the offensive game and to push for the required away goals. The spaces of the Blues will grow bigger and with the fast attackers, it’s almost a matter of time until Chelsea puts the lid on the game. A home win, made clear in the second round, is therefore a very realistic scenario and between Chelsea and Slavia Prague the odds for this one are lucrative. In contrast to the pure home win, which 1.3 odds, the value is significantly higher and the four units are well invested.